Mel was born in Newfoundland, which he said may account for the sense of humour that made him a popular convention and conference speaker. He was raised in St. John's on Signal Hill where Marconi received the first trans-Atlantic wireless signal. His family moved to Vancouver and he completed his schooling at Vancouver College and the University of British Columbia. Mel began his radio career in 1951as an announcer at CJAV Port Alberni and moved the following year to CKMO Vancouver, then to CKWX Vancouver as news editor, and in 1955 was named national sales manager of CKNW New Westminister. In 1957 he was appointed CKNW's general sales manager where he remained until he became general manager in 1970. From 1967 to 1973 he was also a vice-president of Western Broadcasting Co. Ltd. which owned CKNW and president of Western Broadcast Sales. In addition he was president from 1970 to 1973 of Western Productions Ltd. In September, 1974, Mel bought C-FAX Victoria. Seacoast Communications Inc., of which Mel was majority owner and which in turn owned C-FAX, was awarded an FM licence in 1999 and CFEX-FM went on-air in May 2000. In 1988, Seacoast Communications Group bought CKOV-AM and CKLZ-FM in Kelowna. 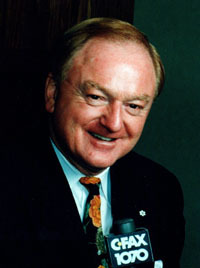 The stations were sold to the Jim Pattison Group in 1996. Mel was president of Seacoast Communications Group and president and general manager of C-FAX from 1974 to 1996 when he became chairman and CEO OF Seacoast Communications and CEO of C-FAX-AM and CFEX-FM. In 1979, Seacoast Communications Group established Seacoast Sound, a multi-media production company, of which Mel was president until he became CEO in 1996. His reputation for innovation and creativity brought him a number of board seats, including chair of AirBC and director of Telus Corporation and the Royal Bank of Canada. In 1985, he donated his services to the EXPO '86 Corporation and was VP of a division that raised a record $174-million in corporate support. He was chairman of the 1994 Commonwealth Games in Victoria. His list of awards is long and includes Order of British Columbia, B.C. Ambassador of Tourism, Junior Achievement's Enterpriser of Excellence, B.C. Entrepreneur of the Year and, in 1989, Member of the Order of Canada. He served as a director of the Radio Bureau of Canada, director of the Bureau of Broadcast Measurement and president of the BC Association of Broadcasters. The BCAB named him Broadcast Citizen of the Year in 1979 and Broadcaster of the Year in 2000. He was presented with an honorary doctorate of laws from the University of Victoria and, for his community involvement, was named an honorary citizen of Victoria in 1998. On January 26, 2004 CHUM Limited announced it had agreed to purchase the assets of Seacoast Communications, which owns and operates Victoria radio stations C-FAX AM and CHBE-FM (previously CFEX-FM) for a purchase price of $7.5 million and the assets of Seacoast’s music production operation, Seacoast Sound, for a purchase price of $500,000. The CRTC approved the application to transfer ownership on September 3 and the stations officially changed ownership on October 1. Cooper agreed to enter into a three-year contract to continue working with the stations as Chair of Community Affairs.